You are invited to a FREE two hour workshop on how to respond to people with thoughts of suicide. The workshop is presented and led by Emma Burns who is a registered psychologist with the NZ Police. This two hour session will provide participants with tools that they can use as soon as they walk out the door. Follow up support will be available for anyone who is interested in learning more about the approach and its application. Emma has spent eight years using the Solution Focused approach working with young offenders, and has recently moved into the family harm team within Police. Prior to this Emma has worked in mental health, education and suicide bereavement. 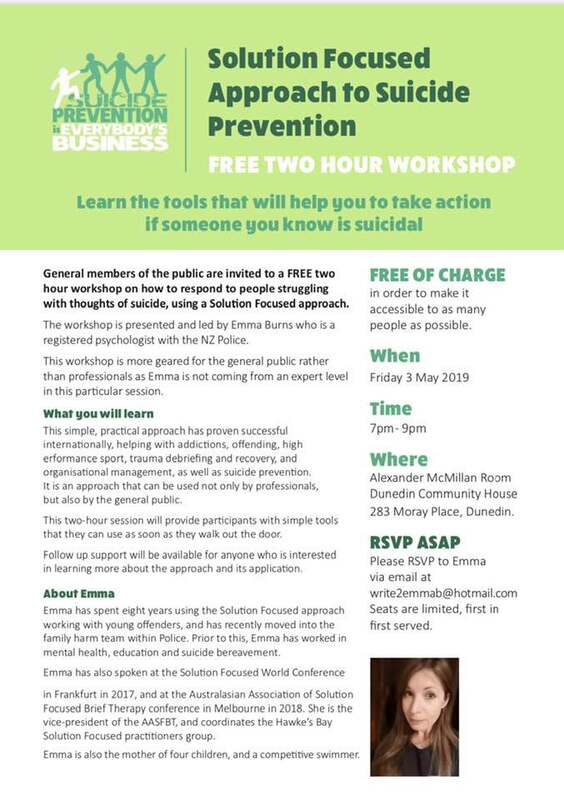 Emma has also spoken at the Solution Focused World Conference in Frankfurt in 2017, and at the Australasian Association of Solution Focused Brief Therapy Conference in Melbourne in 2018. She is the Vice - President of AASFBT, and coodinates the Hawkes Bay Solution Focused Practitioners Group. Emma is also the mother of four children and a competitive swimmer. Koha or gold coin will be appreciated.